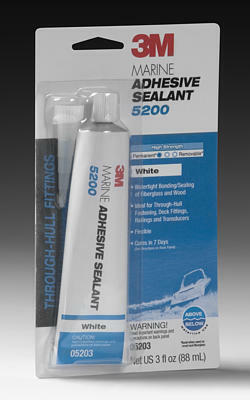 If you get into sailing some day you will come across 3M 5200 adhesive sealant as for me I used it to seal the decks on my Nacra 5.5sl. The first thing you need to know if you use it is you will get this stuff on you or your cloths no matter how careful you are. So keep some Acetone around to get it off your skin if you get it on your cloths MEK will get it off when you catch it early. This is a great product when used for the right application and a nightmare when used in the wrong place! It really should come with a BIG WARNING label the bonding strength should be considered permanent and only be used in areas where think you will not need access again. I have used this stuff sealing the decks on couple of boats but never had to remove it until I recently tried to remove the crossbar on my Tiger which someone used plenty of 5200 on and I have spent 4 days working on one crossbar and I have yet to even get one side loose! I have an extensive mechanical background and have been using tools since I was old enough to ride a bicycle and I can honestly say this stuff has kicked my A$$ so before you use 5200 on anything make sure you will never need to remove that part! ~ by Floyd on July 20, 2011.